Bathroom remodeling can be a great way to make your home more comfortable and to boost its resale value. But if you don't have a lot of space to work with, an effective remodeling project gets a lot harder. Fortunately, there are simple ways to open up even a small bathroom so it feels larger and more comfortable. By being aware of your color and layout choices, you can make the most of what your bathroom has to offer. Pastel, neutral, and white shades will help your space feel more open. You can accent with stronger colors, but the overall theme for your walls, floors, and fixtures should be light. To make the bathroom design feel even calmer and more peaceful, keep to the cool side of the spectrum. The more light in the room, the less cramped it will feel. You want to avoid taking up precious counter space, but wall sconces or recessed lighting can make a major difference. Even better is natural lighting from a window or skylight. By reflecting the light and space of your bathroom, a large mirror can appear to double the floor space. Devote as much of the wall as you can to one or more mirrors—not just a small cabinet over the sink. Visual noise makes a room feel smaller, and the bathroom is no exception. If you have an assortment of products or knickknacks filling your counter space, try to cut down the collection to the bare necessities. As much as possible, use your bathroom remodeling to get rid of anything which sticks out into the room and stops the eye. This can mean bulky cabinets, opaque shower doors, or anything else which interrupts the view and divides the floor space. Design custom cabinets to stay out of the way as much as possible, and choose a pedestal sink instead of a bulky countertop. No matter how small the space you're working with, these tips will make it feel larger and more open. 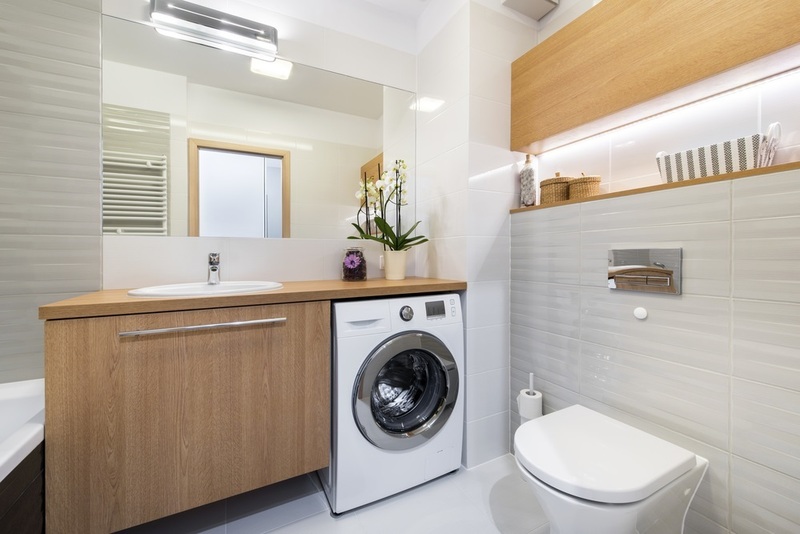 Ditch the dim light and cluttered layout of your old bathroom, and get a new start today! Devine Creations Design Center in Middletown, NJ, offers a wide selection of materials for your kitchen or bathroom remodeling project. Their stock includes tile, stone, and a range of elegant cabinetry options. Go online to see their selection, or call (732) 856-9661 with any questions.